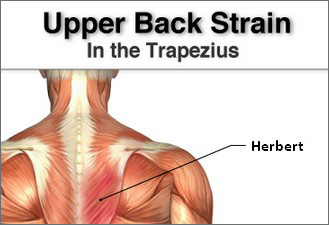 There is a very specific location in the trapezius of right-handed people that fiercely objects to repetitive copying and pasting. I call that location, “Herbert,” and I am very happy to say that I haven’t been in contact with Herbert ever since Taskstream launched its rubric import capability. Rubrics come in all kinds of formats, and may be tailored to accommodate the grading methodology of individual instructors. In order to facilitate comparative reporting and analysis across multiple institutional levels, it’s helpful (but not always mandatory) to employ formatting consistency when creating rubrics. As with systems of currency and movie ratings, using a consistent scale provides a common point of reference for multiple audiences. When I started working at Taskstream in 2004, rubrics were used less frequently than they are today. When an institution adopted Taskstream, assessment coordinators and faculty members often spent the first weeks of implementation using our Rubric Wizard to design brand new rubrics. The tool helped to guide thinking through the design process. It prompted answers to some key questions — What aspects of the assessment will you score? How many performance levels will you include? How is each performance level defined for each criterion? As assessment in general, and rubrics specifically, started becoming part of the fabric of university culture, new Taskstream coordinators came to the table armed with an abundance of resources — curriculum maps, lists of evidence to be collected, and . . . fully designed rubrics! The Rubric Wizard was initially created as a design tool but, for some, it gradually became a tool for recreating rubrics. For new Taskstream users working at institutions with an existing culture of assessment, the rubric building process changed from thoughtful creation to data entry drudgery, requiring a whole lot of copying and pasting. Repetitive motion is delightful for the rare individual who enjoys back pain, but for most of our new users, it made for a poor start to their implementation. It quickly became clear to the Taskstream team that we needed to infuse the Rubric Wizard with some “automagic.” As our development team engaged in research and design, the Mentoring Services team worked to simulate some automagic, often taking on the rubric recreation process to ensure that implementations stayed on track. We didn’t want to put our new Taskstream users through the drudgery of so much copying and pasting. That’s when I became well-acquainted with Herbert. 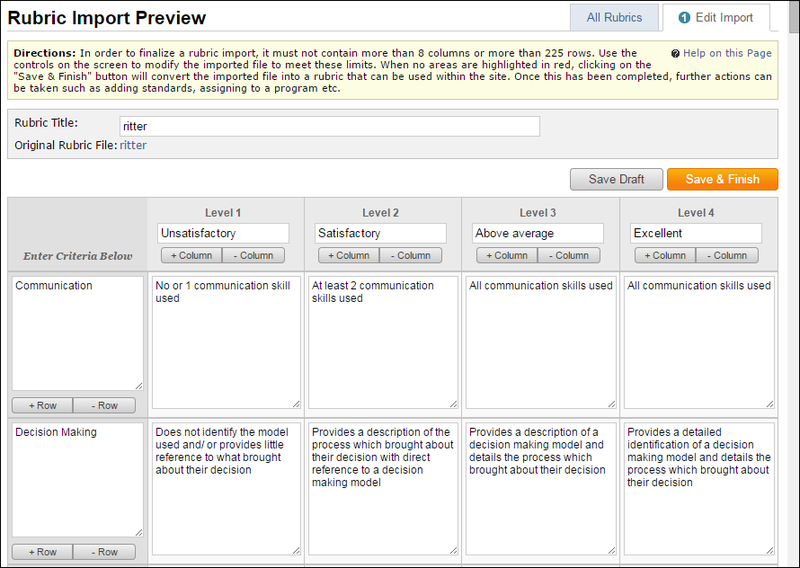 Once our development team launched the rubric import capability in our Rubric Wizard, I bid Herbert adieu. These days, I look forward to using the Rubric Wizard as either a tool for thoughtful rubric design or as the scene of automagic. Although I am happy I have not been in recent contact with Herbert, I also appreciate the insight that he gave me into what was a less-than ideal user experience. I am so grateful that users with readymade rubrics can now skip the copying and pasting, and simply import a Word document into our Rubric Wizard. There may be some minimal clean-up to resolve some mapping issues, but I promise, it is better to delete three times than to copy and paste 120 times. If you’d like to take advantage of our automagical Rubric Wizard, check out our step-by-step instructions! Herbert won’t be along for the ride. 1. 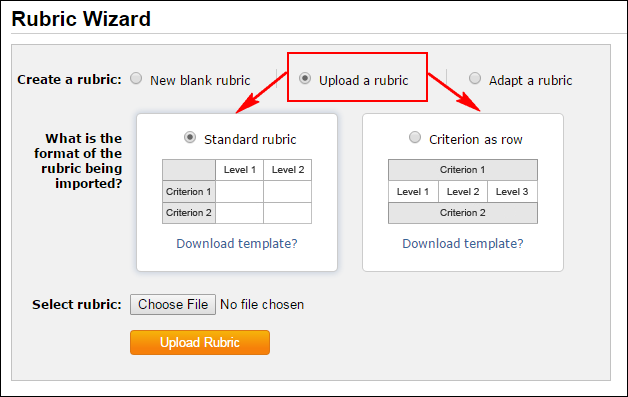 In the Rubric Wizard, select, “Upload a rubric,” and then choose the layout that matches your rubric (your rubric criteria may appear in the left-hand column or banded between rows). 2. Choose and upload your rubric file. 3. You will see the name of your pending rubric file – use the Refresh button . . .
4. Then use the Finalize Import button to push the file through to the Rubric Wizard. 5. Finally, make any formatting changes that you find are needed, then Save and Finish! 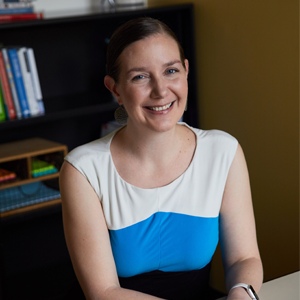 Diana Romer is the Director of Mentoring Services and has worked at Taskstream since December 2004. She received her MA in Education from the University of Florida. She originally hails from Stone Mountain, GA, but has also lived in Jacksonville, FL and Cambridge, MA. She and her husband currently reside in Brooklyn, NY. She enjoys comedy, literature, and travel. 1 Stevens, D. & Levi, A. (2005). Why use rubrics? In Introduction to rubrics: An assessment tool to save grading time, convey effective feedback, and promote student learning (p. 17). Sterling, VA: Stylus Pub.